The English Building on the U of I campus. Picture courtesy of the University of Illinois. Ghost stories of the University of Illinois in Champaign-Urbana have always been of an elusive sort. It has been suggested that perhaps because it is primarily an engineering school, that students here are simply not suited for ghosts. They say that these unimaginative scientists have no interest in the spirit world, but I have never been convinced of these claims. Regardless of the type of university it is, I have yet to find a college that does not have at least a ghost story or two! The University of Illinois is no exception! While there are a number of spots that are allegedly haunted on campus, the most notorious location is the English Building. Many years ago, this structure served as a women's dormitory and according to legend, a young lady committed suicide here after a love affair ended badly. The stories say that flickering lights and slamming doors have long been common here, especially in the former rhetoric room, which was later turned into offices for graduate teaching assistants. This was allegedly the location of the young woman's room and the place where she took her life. Witness accounts say that she still wanders the hallways of the building. The Lincoln Building, which is located next to the English Building, also reportedly has a ghost on the third floor. The apparition that is here is said to often be seen peering out the windows that look out over Wright Street. This occurs long after class has ended and when no one is supposed to be in the building. Another reportedly haunted spot is the central foyer of the Psychology Building. A number of years ago, a memorable event took place here when a student became irrational and threatened to kill himself by jumping off one of the railings on an upper floor. This would have resulted in him plunging several floors to his death. However, he did not jump, but did die a few years later. The stories say that after his death, he did return to haunt the place and has been here ever since. 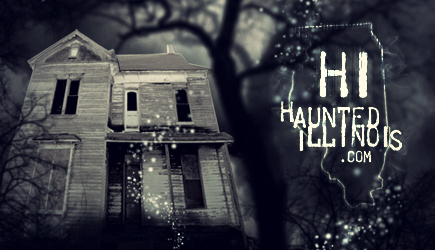 The ghostly presence has resulted in people experiencing unexplained cold spots, a whispering voice that comes from empty room and the sound of footsteps pacing in abandoned hallways. One U of I alumni named Steven Herrington contacted me about some strange experiences he had at the Natural Resources Building while working there as a graduate student from 1997 to 1999. Part of his research assistantship was to work in the ground floor Ichthyology collection, curating specimens. Because of his class schedule, he often worked there alone and during the late night hours. On a few occasions, the building's elevator would engage and would come down from an upper floor to the floor where Steve was working. Upon reaching the ground floor, the doors would open and no one would be in the elevator. This happened on several occasions and Steve later learned that it also happened to a friend of his, who also worked in the building under these same circumstances. "What made this creepy," Steve told me, "is that this, to my knowledge, never happened in the daytime and I knew that I was the only one in the building when this occurred because the doors were always locked after work hours, I could see the parking lot outside was empty and on one occasion, I checked the hallways and rooms on the floor to see if anyone else was there." "It's possible that this may have been something mechanical," he added, "but if it was, it should have occurred in the daytime too. I watched for it to happen and this is what made me question it. It was a minor occurrence that probably doesn't qualify as a "ghost story" but it truly creeped me out when it happened." Perhaps the oddest campus haunting involves the Native American who roams the basement of the University YMCA building on South Wright Street. Decades ago, the basement was decorated with a very large painting of a Native American chief. It had been placed in the student lounge and cafeteria and little was thought about it... until nighttime visitors started to notice something very strange. According to their stories, after all of the lights had been turned out for the night, the chief would somehow leave the painting and wander about the building. Hard to believe? I would have to agree with that, but those who claim to have seen the Indian walking around in the dimly lit corridors just might argue with us! 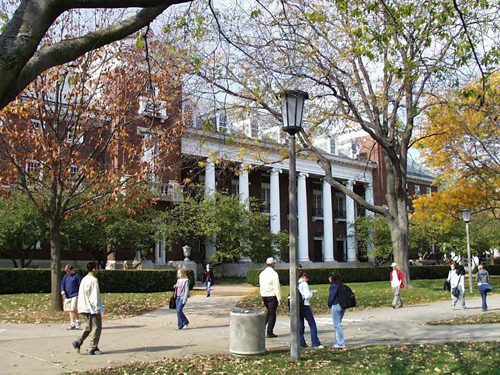 The UNIVERSITY OF ILLINOIS is located in Urbana, Illinois and has a sprawling campus consisting of many buildings, both new and old. There are a number of barely reported and sketchy hauntings said to exist on campus.... hopefully, we can add more in the future!